Chapped lips and numb fingertips are right around the corner as winter draws near, and soon it will be time to heat the house. Most people heat their home by oil or natural gas, which have an unfortunate tendency to rise in price. Heating the home with alternative methods not only conserves energy and money, but it also benefits the environment by reducing fossil fuel dependency. From stoves that burn alternative fuels to solar power and geothermal technology, homeowners have many options to warm the household. If you aren’t afraid of the extra labor of cutting wood, stacking logs and loading the stove, wood makes an excellent fuel—just ask a California firefighter. Wood is an easily renewable resource that evokes a classic, rustic atmosphere when burned as fuel in a stove or fireplace. As an added benefit, if the electrical power blacks out, you still have an operable heat source. Using wood can support the local economy and lower your heating bills. Plus, the latest fireplaces and stoves have evolved beyond the messy, inefficient clunkers of yesteryear. The latest models burn more cleanly and efficiently without the dangerous creosote buildup. Most of what goes up the chimney is just carbon dioxide and water vapor. There is very little smoke or odor. The new units are more attractive, with styles to fit just about every décor, including accents, stone inlays, tiled borders and more. Plus, they’re easier to operate. As the “green” movement gains more and more steam, stoves that burn dried wheat, corn, or pellets made from dehydrated wood chips, are spiking in popularity. The new multi-fuel stoves allow you to burn all three environmentally friendly fuels in the same stove. When used to heat your home, multi-fuel stoves can cut your energy bill as much as 70 percent. These alternative fuels are good for the environment because they are made of endlessly renewable materials that do not rely on fossil fuels. Corn, wheat and pellets also require much less storage space than wood, and heat output of the stove can easily be controlled by the user. Another alternative heating option is geothermal power extracted from heat stored in the earth. This geothermal energy originates from natural phenomena such as radioactive decay of minerals and from solar energy absorbed at the earth’s surface. Geothermal power is cost effective, reliable and environmentally friendly by reducing fossil fuel emissions. In principle, a geothermal heat pump functions like a conventional heat pump, by using high-pressure refrigerant to capture and move heat between the indoors and out. However, geothermal systems transfer heat through long loops of liquid-filled pipe buried in the ground. Because the earth’s temperature stays right around 50 degrees, no matter what the weather is, geothermal systems can easily and efficiently extract and disburse heat through the 50-degree liquid circulating in its ground loop. This provides a much more stable source of heat than conventional heat pumps, which rely on the outside air as a heat source. 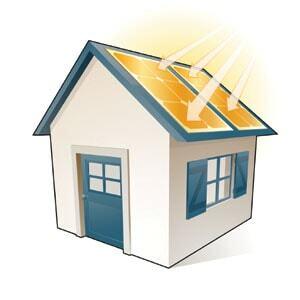 Solar heating is one alternative that is constantly evolving in technology. A typical household system consists of a solar panel with a heat-transfer fluid flowing through it to transport the collected heat to somewhere useful, such as a hot water tank or household radiators. The solar panel is located in an area prone to ample light exposure throughout the day—usually on the roof, and a pump circulates the heat-transfer liquid throughout the system. Another approach to more energy-efficient heating is the use of “smarter” hybrid HVAC systems that utilize two fuel sources for efficient heating and cooling, usually a gas furnace and an electric heat pump. These systems aren’t “alternatives” so much as they present a more efficient means of using conventional power sources. The hybrid HVAC control system is calibrated by your local installer according to seasonal temperatures to switch between the furnace and heat pump, depending on which is the most economical power source for your heating or cooling at any given time. 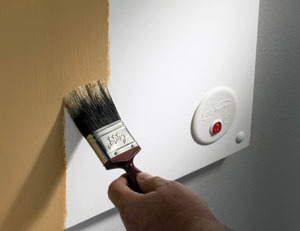 Also, don’t overlook space heating as a simple but effective tactic to reduce energy bills. The average annual cost to heat an average 1,500 square-foot house at 70 degrees is roughly $1,800. With such high costs, it makes good sense to heat only the rooms in which you spend the most time, rather than heating the whole house. Although it does rely on traditional electrical power, targeted heating with space heaters can be a clean, easy and unobtrusive method of reducing overall energy usage. The following is a roundup of a few interesting new systems on the market to conserve energy and mitigate your heating bill. Ingram’s Water and Air Equipment is a geothermal system that is commonly set up with a “well water supply system,” in which heat can be taken from the ground during winter and transferred through a heat pump to the air in your home. Heat can also be transferred back into the ground during summer to cool your home. Since heat from the ground is free, the only electricity needed is for moving that heat between your home and the ground. A geothermal system can lower your heating bills up to 50 percent and cooling bills up to 30 percent. Plus, due to the recent passage of the economic stimulus package, homeowners who install a geothermal system can receive a 30-percent tax credit for qualified installs with no maximum cap. The Ingram’s package was designed with the DIY’er in mind. The kit includes the heat pump, thermostat and everything needed to install a geothermal open-loop system, as long as you have an available water source. (In an open loop system ground water is usually supplied to the heat pump by a drilled well with a submersible pump system.) The only thing you have to do is pipe in the water from a well, a pond or a lake to the heat pump, as well as to install a line to the dump area, such as a creek or river downstream from the source. After the water has been piped to the unit, you will install a slow-closing solenoid valve on the return side of the unit. The power for the solenoid valve comes from the included 220V/24V transformer, which is wired into the contactor set of the unit. The only thing left is to tie in the pipe going to the dump area. That pipe will connect directly to the outlet of the solenoid valve. There are two basic types of geothermal applications. A forced-air application is usually going to tie into your existing ductwork. The second type, a water-to-water application, would connect to some type of radiant floor-piping system, which is usually installed during new construction. To learn more or buy direct, visit www.ingramswaterandair.com. A Yukon multi-fuel warm air furnace can heat your entire home to your desired temperature, not just one or two rooms, whether you are burning gas, oil, electric or wood/coal. And, regardless of which fuel you are using, The Yukon furnace operates at UL-listed high efficiency. If you have your own wood supply, the cost of heating your home becomes almost nothing. And, if you leave for a day, week or more, there’s no problem. 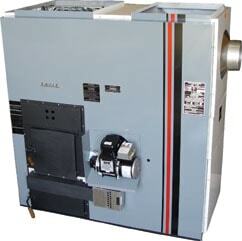 The furnace switches from wood to whatever your backup fuel is, all automatically. Plus, you never have to start a wood fire because the burner does it for you. Air conditioning, a humidifier, or an electronic or filtered air cleaner is easy to add. Learn more at www.yukon-eagle.com or call 1-800-358-0060. The Lennox SunSource integrates solar power with a traditional heat pump—an all-in-one heating and cooling system. 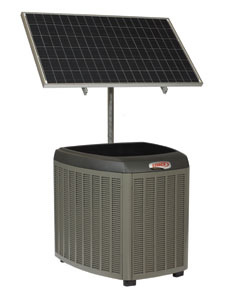 The unit draws energy from a single 190-watt solar panel measuring approximately 3 feet by 5 feet, providing power to assist the fan motor that moves air across the outdoor coil, a critical component in any home comfort system. The solar panel, which should face southwest for maximum exposure to the sun, can be mounted on the home’s roof, on a fence, or on a pole in a convenient location. Even on days with limited sun exposure, Lennox SunSource takes advantage of the available solar resources and reduces energy usage. According to Cunningham, Lennox also is evaluating the integration of Lennox SunSource technology with traditional air conditioning units. For more information, visit www.lennox.com or call 1-800-9-LENNOX. a sealed copper chamber filled with a harmless silicone liquid that will never spill, leak, boil or freeze. Running through the liquid is a proportional watt hydroelectric element that is only being supplied a proportional amount of power on an as-needed basis. When Hydro-Sil is turned on, the silicone liquid is quickly heated, and with its exceptional heat-retention qualities, continues to heat after the Hydro element shuts off. For more information, visit www.hydrosil.com. 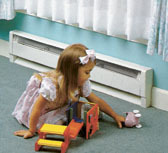 ECO-heaters offer out-of-the-way wall mounting for an economic way of providing efficient room heating. Using convection technology, heat is mainly generated behind the heater in the space between the panel and the wall, which leads to an efficient up-draft of heat circulated into the room. This principle of convection means that about 90 percent of the heat comes from the back of the panel, while only 10 percent is radiated from the front of the panel. This form of “background” heating is not only very economic, but also safe and efficient. ECO-heaters are designed as an alternative to conventional space heaters and other systems that use large amounts of electricity. It operates using the same electricity as four 100-watt light bulbs, while heating an entire room. ECO-heaters save on floor space, they’re safe to use around children and pets, and can be painted to match any décor with water-based Latex paint. ECO-heaters are also designed to be left on for long periods of time, giving you comfortable background heat at a low cost. This is similar in concept to a central heating system, yet far less expensive. ECO-heaters are UL-listed, International Safety Standards-approved and come with a 2-year warranty. Learn more at www.eco-heater.com. The SunHeat infrared zone heating systems are rated to heat 1,000 square feet with no wasted heat near the ceiling. The unique zone process helps prevent the wasteful air layering that occurs with conventional heating systems, and operates for an average of less than a dollar a day. The SunHeat 1500 model requires 3.4-kilowatt hours to heat one degree per day, compared to a conventional electric forced-air furnace system that requires 5.49-kilowatt hours to heat one degree a day. The powerful, compact heater features high efficiency quartz infrared heating elements within solid copper heat exchangers. The unit has an adjustable thermostat to regulate a room’s comfort level, and it operates very quietly. 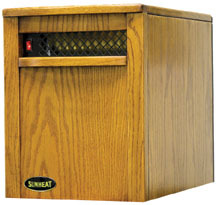 The SunHeat system requires no professional installation and can be plugged into any 110-volt outlet. The heater’s all wood cabinet stays cool to the touch and can be operated without the worry of starting a fire. With the “set it and forget it” thermostat, the unit can run continuously, even while you sleep. Mounted on four casters, the indivually controlled units roll to wherever more warmth is needed to plug into any room. Besides lower operating costs, the system is virtually maintenance-free. The SunHeat has a lifetime washable filter, so there’s no need to purchase high-priced replacements. There are absolutely no burners to adjust or replace. Long-life industrial infrared commercial quartz tubing can be replaced easily and inexpensively. The SunHeat is also designed to maintain desirable humidity levels. No humidity is removed from the air, and water vapor will not collect on windows as readily as with conventional systems. Since SunHeat’s unique concept mixes air at ground level, floors stay warmer. This means the temperature from floor-to-ceiling and wall-to-wall will never vary more than 2 degrees F. SunHeat also comes with a full 3-year warranty, including new commercial quartz tubes. In addition to the SH-1500 model, T&R Distributing offers the SunHeat 750 model, as well as a fireplace model. For more information, call 1-800-491-4690 or visit www.SunHeat.com. The Phoenix Solar unit, Model PH130-80S, is an integral part of the solar- and gas-powered space-heating and domestic hot water (DHW) systems in the home, a 1915 Craftsman-style bungalow located in the Rockridge district of Oakland, California. The Phoenix functions as a storage tank for the solar thermal and hydronic heating systems, while it provides high-efficiency, gas-fired backup when solar power is not enough to heat the domestic water or the home. Here is how the system works: Perched atop the home’s roof, three 4-by-8-foot flat-plate solar collectors from Solar Thermal Systems collect heat energy from the sun whenever it is available. When solar is available, hot fluid from the solar collectors circulates to the Phoenix in the garage, where the heat is transferred to water stored in the water heater’s 80-gallon tank. This water is used for potable hot water applications; i.e., showers, clothes washing, cooking, etc. In addition, an external heat exchanger maintains a second, closed hot-water loop that sends hot water from the Phoenix storage tank to a series of wall-mounted, high-surface-area Myson radiators, located throughout the Gottfried home. On overcast days or at night, the modulating gas burner inside the Phoenix will fire, providing between 44,000 and 130,000 BTU per hour of backup water heating for the hot-water and space-heating applications. “I preferred wall-hung radiators, rather than a conventional, forced-air heating system,” says Gottfried, after experiencing his first winter in the newly renovated residence. “The new system is much quieter and improves our air quality by not blowing pollutants throughout the house. “Each room in the house is a separate zone—eight in all—allowing me to modulate the heating according to the need,” Gottfried continues. “In other words, we heat only the bedrooms at night and only the main living areas during the day when we are home.” Helping to lower consumption and save energy. For more information, visit www.htproducts.com.